School of Law, Three Gorges University, Yichang, China. There are millions of Chinese workers in Japan, most as trainees and interns hired in small or medium sized industries. gal view for the future at last. 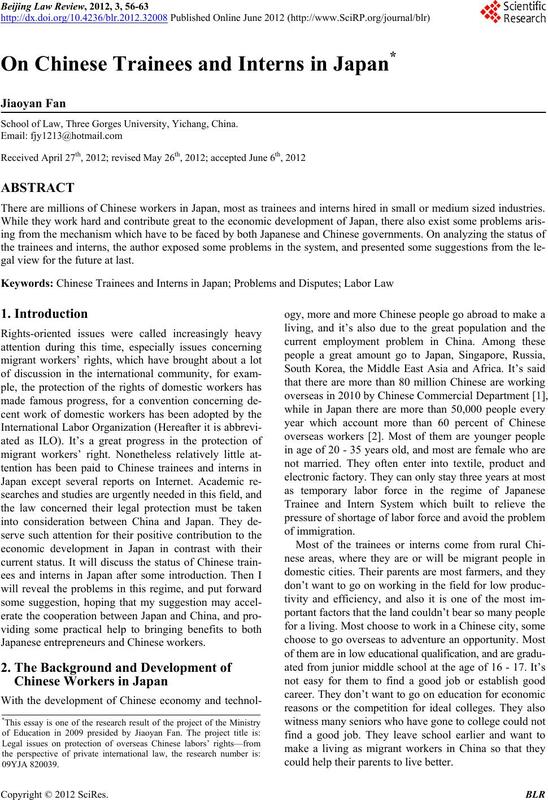 Japanese entrepreneurs and Chinese workers. could help their parents to live better. three years and miss their friends in Japan. people such as those from Guangdong, Fujian province. and the Japanese Town was formed. make a living, and they could make a living on the land. they will not let you come home if you irritate them. but the life is steady and can be controlled. adventure for a better life. Japanese medium and small factories. day. She said in thoughtful expression and a bit sadness. and a quarter break between10 to 12 in the morning. do. They work hard every day, and don’t feel unhappy. more time to plan for her future. people lived there qu ietly and happily, op en and friendly. day, to see her boss and her friends and all in Japan. a junior middle school graduate. Malaysia later. I blessed her a better future. China, except some insurance fees which should return. pan, but they both treasured their experience in Japan. long time for them to return, mentally or in life styles. called “the Incidents of Huang Shi Women Workers”. Japan sadly without fair compensation. nies, the supervising organizations and intern trainees. theless they are on the same direction. intern trainees also must obey the regulations strictly. stitutional law. In fact it is the supreme law in the field. concrete laws are needed in practice. labor standards offices for language or cultural obstacles. there are serious legal loopholes existed in the system. little time and limited means to run away or seek help. they are sent back to China. the intern training program typically. further research should be conducted in the field. understandi n g and coo perat i o n.
violation minimum wage laws (159 cases) and etc. is not the win-win model for both countries. tected better than current time. months, some are trained even longer than 6 months. a small amount for young people or their rural family. For this they have to work overtime as much as possible. the sources of people who want to go to work overseas. as employees, and no labor rights are entitled therefore. to reach some cooperation agreement. needed, and further cooperation should be advocated. dream, and the realization of the dream is so beautiful. They love it and they will keep it in heart fo r a long time. May TITP have a good future. Foreign Labor Service Cooperation and Business,” 2011. 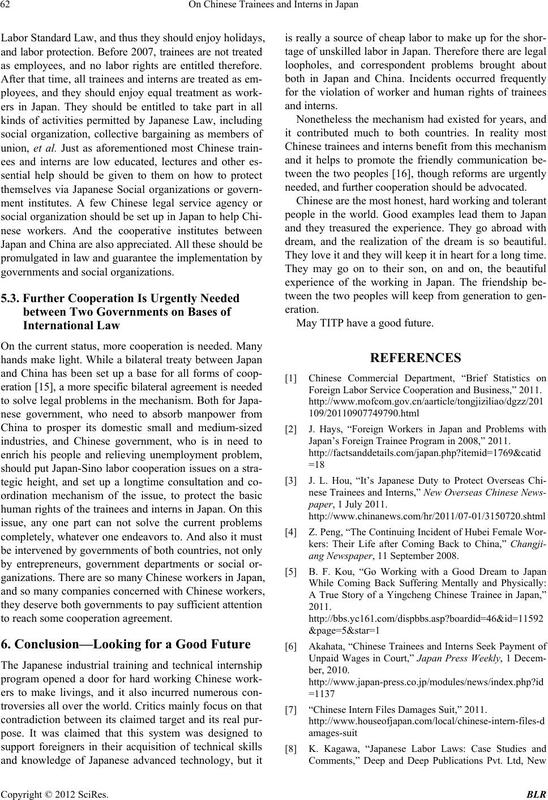 Japan’s Foreign Trainee Program in 2008,” 2011.
ang Newspaper, 11 September 2008. “Chinese Intern Files Damages Suit,” 2011.
pan’s Trainee and Intern Program,” 28 February 2008.
gration Papers, International Labor Office, Geneva, 2004.
cific Journal: Japan Focus, 15 July 2008.
ence and Technical Cooperating Agreement,” 1980.
the Chinese New Year Festival,” 2009.